INDIANAPOLIS — In accordance with a presidential proclamation issued today, Thursday, Dec. 3, Indiana Gov. Mike Pence is directing flags at state facilities statewide be flown at half-staff in honor of the victims of the tragedy in San Bernardino, Calif. on Dec. 2. INDIANAPOLIS — Gov. Mike Pence is directing flags at state facilities statewide be flown at half-staff Friday, Sept. 11 in honor of Patriot Day. 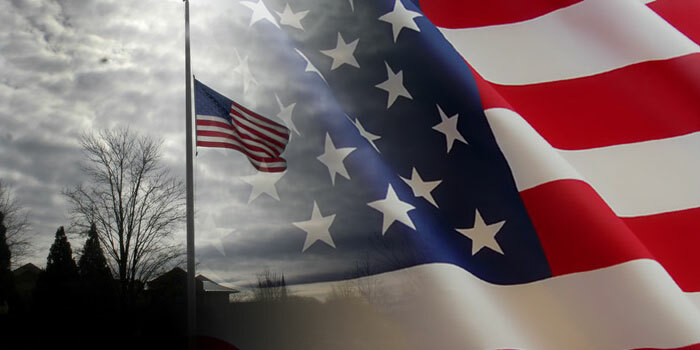 Flags should be lowered at sunrise and remain at half-staff until sunset on Friday, Sept. 11. Governor Mike Pence is directing flags at state facilities statewide to be flown at half-staff Monday in honor of Memorial Day.